Mabberley, D.J. The Plant-book: A Portable Dictionary of the Higher Plants. Cambridge University Press, 1996. Pham Hoang Ho 1993, Cay Co Vietnam [Plants of Vietnam: in Vietnamese], vols. I, II & III, Montreal. Buckingham, J.S. & Petheram, R.J. 2004, Cardamom cultivation and forest biodiversity in northwest Vietnam, Agricultural Research and Extension Network, Overseas Development Institute, London UK. 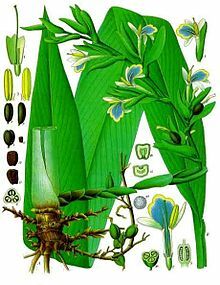 Aubertine, C. 2004, Cardamom (Amomum spp.) in Lao PDR: the hazardous future of an agroforest system product, in 'Forest products, livelihoods and conservation: case studies of non-timber forest products systems vol. 1-Asia, Center for International Forest Research. Jakarta, Indonesia.